A teacher was fired after she refused to abide by school policy of giving students 50% grades despite them doing zero work. Port St. Lucie, FL — A teacher in Port St. Lucie, Florida is now speaking out about how she was fired for refusing to give students partial credit for work that they never turned in. That’s right, for giving students a zero for completing zero percent of their work, Diane Tirado says she was fired. School policy dictates that she was supposed to give them at least 50 percent—for nothing. “I got fired. I was packing my stuff, and I was not going to see the kids,” former teacher, Diane Tirado said. Because she wasn’t allowed to say goodbye to her students, Tirado wrote the following message on her whiteboard, explaining what happened. The words are profound and expose a major problem with “education” in America today. 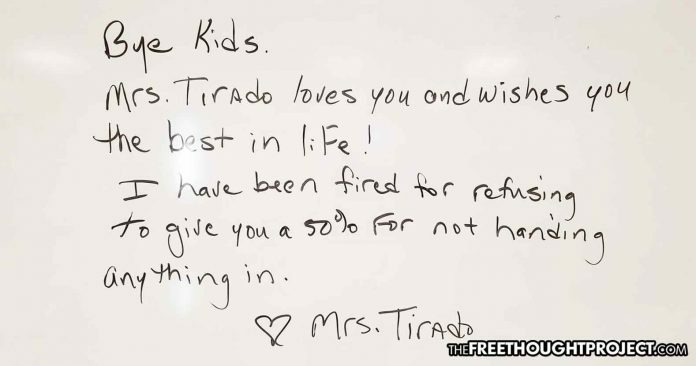 Tirado then snapped a photo of her statement and walked out of the school doors for the last time. She then uploaded that photo to social media, which went viral for all the right reasons. What Tirado wrote on her board is actually part of the school policy and it exposes an ominous problem within the American public education system in which kids are rewarded with partial credit—for doing absolutely nothing. The incident unfolded earlier this year when Mrs. Tirado said she gave her students two weeks to complete an explorer’s notebook project. She explained that some students never turned it in, so she gave them zeros. In an interview with WLOS, Tirado pointed out the sheer lunacy of this policy using very simple logic. As WLOS reports, her Sept. 14 termination letter doesn’t cite a specific reason, only stating she was contracted as a teacher on a probation period, and that she can be dismissed without cause. On Tuesday, Tirado, in another viral Facebook post, explained her reasoning behind this stance she feels is so important and noted how she is trying to get the policy changed. What this policy implies is that students aren’t really in school to learn. Getting taught information and then gauging how well you retain that information is a rudimentary part of education. But this simply isn’t happening. Instead, kids are taught to simply conform, sit in the classroom, and even if you don’t do the work, this conformity will get you half the grade. As TFTP has pointed out on several occasions, standard education in America typically focuses on creating a supply of worker bees who follow orders from authority and operate within the confines that the system has set out, but lack critical thinking skills. Having a “no-zero” policy even when students do zero work essentially teaches children that their mere obedience is enough for half of the credit—a worrisome fact indeed. One of the most viewed Ted talks of all time lays out the results of such an educational system. It was given by Sir Ken Robinson in 2006, where he explained how traditional education virtually kills creativity. Indeed, his claims were recently backed up by a NASA study which set out to find the most creative kids in the country and accidentally discovered that the education system is destroying children. Dr. George Land and Beth Jarman were commissioned by NASA to help the space agency identify and develop creative talent. The two were tasked to research school children in an attempt to identify creative individuals from which the agency could pick to help with their many products. Land recently described his team’s surprising findings on the education system which are nothing short of shocking. It seems American schoolchildren lose their ability to think creatively over time and it is due to public education. As students enter their educational journey, they retain most of their abilities to think creatively. In other words, children are born with creative genius. Employing a longitudinal study model, Land and Jarman studied 1,600 children at ages 5, 10, and 15. Upon entry into the school system, those numbers started to drop—dramatically. When the team returned to test those same subjects at age 10, the percentage of genius-level imaginative and innovative thinkers fell to an unthinkable 30 percent. The indicators led the researchers to believe the current educational system is to blame. A whopping 68 percent of those students lost their ability to think with imagination and innovation. The downward spiral continued to be demonstrated at age 15. When the researchers returned, the percentage of genius-level students had dropped to an abysmal 12 percent. Because schools now give 50 percent credit even if no work is done, they are proving to be more like factories than ever as a factory’s role is to maximize the efficiency at which it turns out products. Sadly, these “products” are human children who are being taught to support the very system that treats them like this.